scan to about 28:50 in and take a look at that recruiting poster. 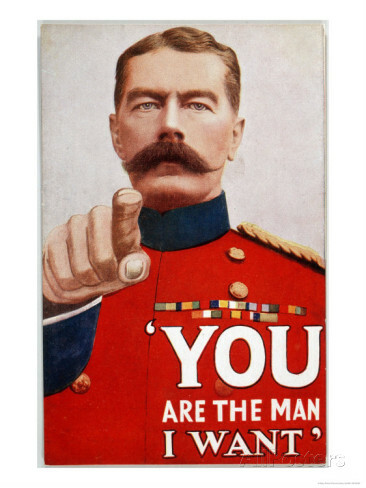 It is a vivid, colorful variant of the famous “Lord Kitchener” poster. One detail I’ve remembered about the day I decided to re-enlist was the poster being in more than just black, white, and red like the usual version. It had a full-color portrait. The one in the documentary is closer to the commonly-seen one. However, it does have an interesting detail: it specifically calls for ex-soldiers up to 45 years of age! This tells me a little bit more about why I made the fateful decision that would bring an otherwise-unremarkable past life to an early and violent end. Just on a whim though, I did another search for variants of this poster after I found this documentary. I did not expect to find this full-color variant which is without a doubt the poster I saw that day in September 1914. One of the things that always bothered me was that poster. I had remembered it in full color but an initial search failed to turn up any such poster. It was always the classic one that has been reproduced innumerable times. This was one of the details that had always cast a shadow of doubt over the first memories to break in late 2012. Every time I think I can’t confirm anything else, a new detail like this pops up. Incidentally, I’ve been reflecting a great deal on exactly why I made the decision back then. What I remembered was that Lord Kitchener reminded me of my father, and that I probably felt like I ought to do this. A sense of what might be termed filial piety, I suppose, but in a uniquely British context. I have little doubt that my father (who, according to what I’ve read in the official records, outlived me by about four years) wanted me to enlist and that it was out of a near-religious respect for him that I was initially moved. On the other hand, I remember my “Gethsemane moment” too. I remember wrestling with the idea and ultimately subscribing to the myth that I was destined to put everything on the line and either become a sacrifice or a gentleman by the end of it all. This does not exclude the above but was probably an exacerbating factor. Another factor I seem to remember was not having much of a civilian life to begin with. I remember taking diction classes to learn to speak in a posh dialect and getting nowhere with it, though I had my eye on jobs waiting on the well-to-do as a means of learning the ins and outs of high society from an accessible spot. It didn’t work out; after a while I began to miss the security and structure the army gave me. Once again, this is not to the exclusion of either of the above but adds fuel to the fire. There had to have been some reluctance, though. War was declared in July, and I could have re-enlisted earlier in the summer. Instead, I waited until the big recruitment drives at the end of the Summer. I had a memory of being in love with a woman named Anne and although it can’t be confirmed, it is rather interesting that after the war, my brother Albert probably married a woman whose middle name was Anne, if the grave in Yeovil is indeed my Albert. I don’t believe I was Albert myself because the poster was definitely in Hereford when I saw it. I very likely left her without a sweetheart and that couldn’t have been an easy decision for me, since I remember us being head-over-heels for each other. Nonetheless, I have a feeling that by the time I traveled to Nuneaton (which I have since learned, at the time, was a staging area for the Regular Army of which I was a part), I was completely sold. I had fewer reasons to stay in Hereford than to march off to the front. Fewer reasons, perhaps. But I did have a choice and I still carry a burden for that. I made the wrong choice, and now, 101 years after that life ended, I’m still dealing with the fallout from that, trying to make sense of where it all went wrong. Yesterday evening, my fiance and I finally got a chance to try HEMA (historic European martial arts). First, an admission: if I ever had any skill with a blade, I lost it many lifetimes ago. I was reassuringly average at it for a first timer. That being said, I found it challenging, exciting, and something I want to pursue, to the competitive level if possible. I found that it gave me something I didn’t realize I needed: a disciplined outlet for my aggression and inner turmoil. Turning a dark thought into a series of calculated actions and learning to act with calm nerves in the face of danger (the swords are blunted but they are full steel and can still hurt you) seemed to awaken something better in me that I hadn’t anticipated. Also, it will help me condition my body. Out of all the things I’ve been conditioning, my body hasn’t been the priority it should be. This could finally help me turn more fat into muscle and get the stamina and strength I need. I’m sold. This won’t be easy but it can only be a good thing. I didn’t put the philosophical questions of a possible past life as PKD as neatly aside as I had pretended. I suppose from an earlier entry some of my readers might have guessed that. I am still deeply bothered that, if I was him, I’m still here in this continuity where he’s given up for dead, not a whole hell of a lot has changed, and Ferris Fremont Donald Trump has a real chance of becoming president. I was kind of guilted into trying not to think about it for a while by someone who I’m not sure I can count as a friend any more. We didn’t really speak after he began spouting more and more bile against Muslims on Facebook until one day, he made a really patronizing post about why the LGBT community should hate Muslims as much as he does. I made a friendslocked post on my Facebook calling him out and coming out trans for probably the first time to a lot of people who watch me, and I haven’t heard from him since. Anyhow, this guy- let’s call him J- was quite adamant that I couldn’t have been PKD, in part because he was convinced he’d ascended into the pleroma. And the thing is, Phil was convinced he would ascend into the pleroma too. J had a point. If someone like him couldn’t transcend the cycle of death and rebirth, then what was the point? I’d been reluctant to talk to anyone about this since. Most of the people who were willing to listen had little to offer. But I finally got a chance to talk at length with my bishop about it, and he basically offered the idea that if I was him, and I’m still here, then there must be a point to it because we do have something to accomplish. J was the sort of person who would have abhorred the idea that there was any point to being here. He referred me to a Buddhist writing which called the world a “burning building” and was very adamant that escape was the only valid goal. I had internalized his ideas because first, J seemed to know what he was talking about most of the time (except when it came to Muslims… and the economy) and second, because he and I share some admiration of Rev. Dr. Stephan Hoeller, one of the great scholars of gnosis of our time and, incidentally, the bishop to whom my local bishop answers directly. But back to my talk with the bishop. This was right before I went on my long drive out to Aurora and had my breakthrough about my tendency toward a savior complex. I had started reading Phil’s novel “Radio Free Albemuth” some time before but hadn’t finished it due to distractions. But it’s an important piece of the puzzle. It’s an honest, story-driven take on Phil’s experience rather than a Gnostic tractate with a picaresque novel written around it like “Valis.” And in it, I found two pieces of wisdom that really resonated. One of them was the ending. Let’s see… how do I describe this without spoilers? Old growth is cleared away, leaving the younger generation to flourish and carry on. That’s the archetypal theme. I imagine there’s probably an I Ching hexagram that corresponds to that though I’m still learning I Ching. Essentially, the torch had to be passed to a younger generation. Phil had to die because perspectives had to be renewed. If I was him, then it could be by design that I was brought back here. The other one is the idea that the end goal was not mine to know or strive for; if I was meant to be part of it, then I must trust that the Lord has already made a path for me and follow it. This has been reinforced by the fact that my attempts to advance beyond my boring but stable existence into a better career or some kind of position of leadership have been thwarted by forces beyond my control. I always have the sense but not the certainty that something is keeping me on this path, like I’m on rails, and that this path is good and right and where I’m meant to be even if it tries my patience sometimes. There is no reasonable way forward for me except to continue on the path that has been set before me and not let my ego get in the way. I am doing well in my spiritual growth in this church and I believe continuing to study for holy orders is the correct place for me to be. I am doing well working part-time and recovering, albeit slower than I’d like, from the shock of Jack’s memories. I am doing well writing the kinds of stories I want to publish with a publisher willing to print them provided they’re of suitable quality. I am doing well in my historiography about Count William as well. These are the gifts I’ve been given. These are the tools of my path. I waver, I falter, I get distracted, but I always reaffirm my direction when I meditate deeply upon it for any length of time. Some days it feels so surreal to have a calm, easy job with very little danger. Some days I feel like I just got back from a war that ended 98 years ago, and that the life I’m living now is a strange, jarring adjustment even though I can recall everything that led up to this point in my life. It’s as if I’m simultaneously aware of the intervening 101 years since his death and yet still dealing with the fallout from the war as if I only found out what happened four years ago; like that part of myself had been unconscious, unrecognized, and unable to begin healing until that terrifying moment when it all came screaming out of the blue like a whizz-bang. There’s no resources for people like me. The few counselors and psychiatrists I’ve talked to are stumped. I’m not psychotic and in all likelihood, not fantasy-prone. At least, fantasy-prone people don’t read as classic PTSD cases to complete strangers. I do. I have had several people- some doctors, some PTSD sufferers themselves- recognize those features in me without being told about them. I had some pretty bad anxiety before, but I never actually had a real, honest-to-God panic attack until those memories broke. Whatever happened- whether it was a self-inflicted mindfuck or a genuine recollection of a past life- it seemed very real to me and it’s had many of the same effects you’d expect of having a genuine memory of this nature. All I need is for someone to recognize that whatever it is, I’m hurting and the pain is real. Some days it feels mercifully far away but all it takes is a single explosion or a strong whiff of chlorine and it’s back. I keep hoping that one day, some outside-the-box therapist or doctor will see this blog and take me as a patient, charge free. All I can pay is my story and a case that’s so unique it could be a case study for years. I need someone who is willing to go the extra mile to really understand what’s going on, who will read my books, listen to every little story, and look at the big picture to try to make me whole again. I keep hoping and praying you’re out there but so far, nobody has come forward. I had a brief memory flash of serving in India during colonial times. Now, I know for a fact that Jack (the life I lost in WWI) had served most of the Edwardian era in Secunderabad. However, the flash I had was of going into arid hills with a band of soldiers to hunt bandits. According to a quick scan of search results on Google, hunting bandits in arid hills sounds more like the 19th century. I am pretty sure that I was a soldier in my mid-19th century life, but could I have been in India during that time as well? That would be two lives, back-to-back, as a British soldier serving in India. I’d had a strong feeling that I had been to India in that life before, but after I discovered Jack’s tour of duty in Secunderabad I had nixed that. I hadn’t considered that I’d been there in two subsequent lives. That would explain why the flowery trappings of British Victorian orientalism seem so stuck in my head, in some deep place that I can’t quite see. Two lifetimes of that is enough to make a deep impression. Every time I saw some fragment of that cultural phenomenon while I was in England in this life, it gave me weird feelings. The Royal Pavilion at Brighton was downright eerie in that respect, with its orientalist whimsy bordering on madness, stylized banana leaves all around in places where they were really not needed. In some part of my mind, I see flashes of dark, smoke-filled rooms with dim lanterns and brightly-colored fabrics all around. I smell a hit of exotic spice. But this isn’t a place I’ve been necessarily; it’s a cultural construct of a place I thought India might be all those ages ago and it’s still there, in my mind, a dated and ego-dystonic construct born of Imperialist naivete. I wish I could remember something more, something concrete that I could track down and confirm once and for all. What did I do as a soldier in that earlier life, and what went wrong that saw me drummed out and turning to the seafaring life? Thinking of doing a past life regression again soon. It seems that earlier life has come through pretty clearly in regressions and dreams, so it’s probably not very deep in my subconscious. Exactly why this life in particular would be so close to the surface is anybody’s guess. So a while back, I had the idea to create a small, portable shrine to my WWI life as a means of closure. It would be creating the sort of box or tin of items that might have been left behind had Jack’s belongings stayed together. But a couple of things happened. First, I didn’t have the money which was a deal-breaker. Second, I was kind of enjoying the stretch of time when I wasn’t feeling particularly disturbed by those memories and I was trying to avoid dredging that up, hoping it was finally behind me. The need for closure has reared its head again, so I’m back in the process of buying items bit by bit to assemble into this simulacrum of the sort of thing an Old Contemptible might have kept in his sock drawer after the war. I already had my first item, a sixpence from 1913 (and a shilling from 1893, which will be among the items that aren’t WWI related but give the impression of a person who might have been pressed for a safe place to keep a special item). I’d had these coins for some years and I thought it interesting that I was drawn to these specific coins one day about 18 years ago. The stereo slides will go in a general collection of ephemera I’ve been amassing, but the lighter (probably a reproduction) will go in the shrine. *An Edwardian box or tin to keep everything in. *A recreation of the letter Jack’s father likely received upon his death. *A print of a photo showing soldiers from the KSLI (I just need to find a suitable paper stock to print the image on). *Reproductions of Jack’s medals (sourced but expensive). *Assorted paper items such as manuals or chits (if I can find them) or period papers not necessarily related to the war such as old ticket stubs. *A pressed poppy from Flanders. The shrine will be kept, just as Jack might have done had he had the chance, tucked safely away in a dresser drawer. I think part of the reason it came to me in an antique store out in the country is because of the fact that this setting has a deep connection to my psyche. In fact, I think if my subconscious was a building, it would be an antique store in the middle of nowhere. Chock full of fragments of lives I’ve lived, many of them forgotten to conscious thought but not lost forever; in the nooks and display cases I can still find them, if I explore long enough. I often have dreams of taking long drives down narrow country roads and stopping at antique stores. It’s an archetype that is ever-present in my mind. In a way, what happened yesterday was like descending into a dreamscape where I could freely explore the subconscious. There was also a disinhibiting stimulus- I had attended mass that morning, and was still feeling that sense of timelessness in the road with its old bridges and roadside fixtures and in the little town and its antique stores. I had opened myself up to that timelessness and was in a liminal state when I drove into Aurora. I still felt that time had stood still for me after the third or fourth store. Also, I had to really sleep on it to gather this, but that one moment in Jack’s life and the place it came from is significant to so many of the things I angst over here and now. This is relevant to my lingering questions about gender (after all, I still have that impression of stoic Victorian masculinity lodged in my being some place where it won’t be removed easily). It’s relevant to my tendency to see myself not having much of a future, seeing myself being killed in prison for something I’ve done or said as if it’s an inevitability. It’s relevant to my courageous and idealistic but ultimately self-serving tendency to rush headlong into causes where I know full well that I’m putting myself in danger. It’s relevant to so much of my angst about the upcoming presidential elections. This probably isn’t the only significant thing I can learn from past lives, but it’s the most significant thing that I’ve come across in a very long time and it’s a pretty big deal. One more thing: I tried to find a piece of music that carried the same emotional charge for me as the feeling I’ve tried to describe. I tried the usual British flag-wavers like “I Vow to Thee My Country,” “Land of Hope and Glory,” and “Nimrod,” but they just don’t do it. The only piece of music I could really think of that does it for me was the Adagietto movement from Mahler’s Symphony No. 5, especially the first few bars of it. Imagine that playing over the story I posted, during the part when Jim is telling Evelyn not to cry.